This problem was observed on Windows 7 with SP1, in which Internet Explorer 10 and Google Chrome are both installed. Even if this is not your setup, it is possible you have a similar problem, but no guarantee is made. While trying out the Google Chrome Extension Getting Started tutorial, I immediately ran into problems with the example app not working. After a bit of troubleshooting, I discovered the problem was that the file popup.html did not exist – which is exactly what the error message is complaining about. I did have a popup.htm file, though – notice the missing 'l' at the end. It turns out that I downloaded the sample files using Internet Explorer 10. For some reason, Internet Explorer 10 renamed the file popup.html to popup.htm which meant the file did not match the manifest, which meant the file in the manifest could not be found, hence the message. It is not the friendliest error message, but it is correct – if you understand it. Pretty standard, and somewhat misleading, message – I assumed it meant the “kittens” page was not found. This line had me stumped. 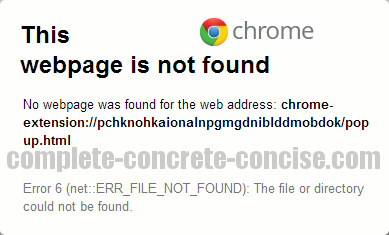 Obviously this is not a valid URL, so it is not surprising the webpage was not found. Once you know what the previous line means, this one simply repeats it in different words.